Gealex Toys Manufacturing Co. Ltd. is a leading general toys, electronic toys, electronic products, electrical products, premium & gifts manufacturer in Hong Kong established since 1978. Product diversity is the winning strategy of Gealex Toys Manufacturing Co., Ltd. We carry a multifarious array of innovative toys suitable for children at different age groups and with different interests. New items are introduced promptly and frequently to catch up with the latest trends. We invest a remarkable amount of resources and capital on the production facilities in order to boost the productivity and product quality. Gealex has established the fully equipped plants in Shenzhen and Huizhou, Guangdong province of China which employ about 900 workers. Factory plants space has 22,000 square meter. We have integrated operation including R&D Department, Engineering Department, Mold Department, IC Chips Bonding Department, SMT and Soldering Department, Plastic Injection Department, Blow Molding Department, Paint Spraying Department, Pad Printing Department, Product Assembly Department, Sewing Department, Quality Assurance Department and Internal Laboratory Department. Besides, we endeavor to reach for excellent product quality. We have granted ISO 9001: 2008 qualification, ICTI and C-TPAT certificate. All products comply with safety regulations and standards of United States – ASTM, CPSIA, Europe – EN, Japan – ST, Korea – KC, China – CCC and global safety standard. We pay high attention on product quality and social conduct compliance. 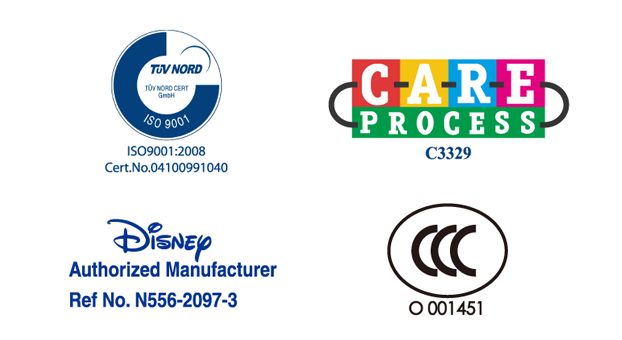 Therefore we gained authorized manufacturer of Disney, Wal-Mart, K-Mart, TRU, Tesco, Marks & Spencer, Takara Tomy etc. We pay high attention on product quality and strong sense of product safety issue. Our products are tested and evaluated at different stages to assure the fulfillment of global toy safety standards. Products undergo various internal test in our well-equipped internal laboratory. Such as EN71, Heavy Metal. Besides , we have a perfect IQC and QC check instruction manual on all incoming materials and products. All materials and finished products are according to MIL-STD-105E quality standard for inspection. Furthermore, we will arrange internal training on all updated safety regulation. In the R&D stage, we first eliminate designs with potential safety hazards. Products then undergo various internal tests during the engineering phase in order to make sure they are reliable and safe. All items must be awarded test certificates from outside accredited laboratories. We have sufficient ability in production operation and new project development, we have strong engineering team which support us in making high level products. Apart from our own brand products, we have rich experience in managing the OEM and ODM projects. We have established excellent relationships with our OEM and ODM customers. In the coming years, we would continue to explore the new markets and develop more core competencies into competitive advantage in order to enhance our competitiveness.